Should legal disputes be negotiated and settled before civil litigation commences? Absolutely- so long as the delay in filing the suit or seeking protective orders does not jeopardize the preservation of evidence and/or assets. One of the most useful and economically efficient things we can do as experienced trial attorneys is to keep our clients out of court- as much as possible, and instead prevent, negotiate and/or settle accordingly. Often times, the parties (and/or their attorneys) act in haste in filing a suit, and hence commencing an often costly process without first attempting to informally resolve the matter. Litigation should be the last resort- as surgery should be in the medical field. However, when all efforts to heal the patient have failed, then surgery may be the only choice- as sometimes is the case in the legal field. Negotiations and settlement is an art and may be involved; however, if there is any chance of resolution, then all efforts should be exercised, and exhausted, before litigation commences. Clients should be afforded several options before deciding to proceed with (or without) litigation. Attorneys should evaluate the facts and law, and develop strategies and arguments in preparation and presentation of their settlement offer. 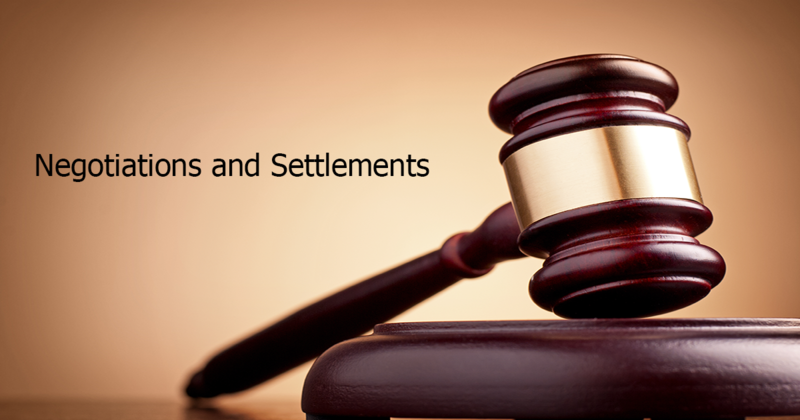 Negotiating and settling lawsuits should be a major priority of litigation attorneys when appropriate. Realizing trial and litigation can be costly (both monetarily and non-monetarily), attorneys must do everything possible to negotiate and settle disputes before the client spends unnecessary money litigating.